What are my options for English language classes? At the Calgary Immigrant Educational Society (CIES), we know that learning English is an important part of settling in Canada. 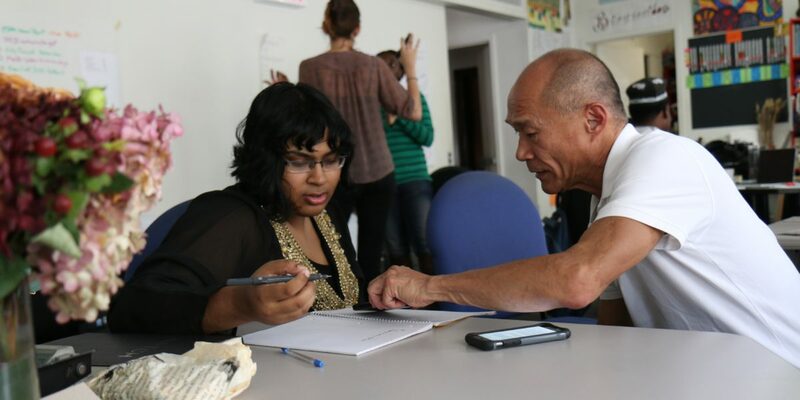 To learn English faster, many immigrants attend English language classes offered all over Calgary. CIES offers many English instruction programs for newcomers. While there are too many different classes to discuss here, we want to introduce you to a few that we offer and give you ideas on how to get started! What is the best English class for me? Immigrant Services Calgary (ISC) offers a number of English testing and referral services. Testing is available at the Immigrant Language and Vocational Assessment Referral Centre (ILVARC). It is important to get tested so you can be referred to the English language class that is best for you! For more information, contact ILVARC at ILVARC@immigrantservicescalgary.ca or 403-262-2656. Counselors at Immigrant Services Calgary (ISC) are the most qualified at referring immigrants to English language programs. You can also do your own research through their website; they have a directory of English Language Learning programs that can be accessed here. It’s a good idea to ask for a referral to an English class when you make your appointment to have your English tested (see Step 1 above). Step 3: Choose your class! Check the next section for information on these programs! CIES offers many options for English language classes. Students with all sorts of schedules, needs, and abilities can find a class that suits them best. Click on the pictures to view the program page. You can find out more about the English programs offered by CIES by calling or visiting our office. We have 3 locations to serve you, in Forest Lawn SE, Whitehorn NE, and Westwinds NE. Thanks to Colyn deGraaff and Asantewa Nkuah for help with this guide. If you want to suggest a correction to this guide, or want to submit one of your own, please contact us.